NEWPORT, Ky. — Thomas More College and the WAVE Foundation, a nonprofit in partnership with Newport Aquarium, have announced the launch of a new speaker series focused on marine biology and conservation. Starting Sept. 9 at the award-winning Riverside Room at Newport Aquarium, the Marine Biology & Conservation Lecture Series features an exciting lineup of scientists, educators, explorers and conservationists who will speak on the topic of marine systems and their safeguarding. “We are very excited about the caliber of speakers for this inaugural year of the lecture series. Each presenter is a renowned expert in the fields of marine biology and conservation and will speak about their ongoing research programs,” said professor Christopher Lorentz, director of TMC’s environmental science program and of the school’s Biology Field Station. 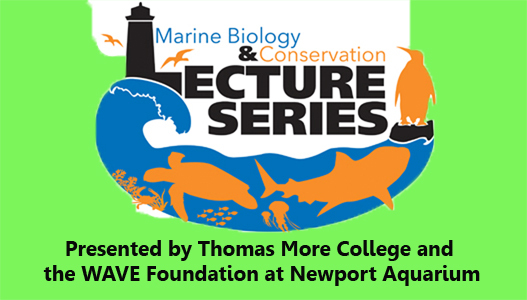 The lecture series is part of Thomas More College’s partnership with Newport Aquarium and the WAVE Foundation, which formally began in August 2014 when the school launched its new marine biology degree program, the first of its kind in the state of Kentucky. Thomas More College Biology Field Station. Each lecture includes light appetizers and drinks, live animal encounters and a question-and-answer session. The first three dates of the series have been confirmed, starting on Sept. 9 with the “Ocean Doctor” David E. Guggenheim, a marine scientist and submarine pilot who navigated the first manned submersible dives into the world’s largest underwater canyons inside the Bering Sea. The second speaker in the series will be Craig O’Connell on Jan. 20, 2016. O’Connell was featured on several Discovery Channel programs during Shark Week 2015 for his research on the electrosensitivity of hammerhead sharks. Lucy Hawkes is the third confirmed speaker of the lecture series on May 18, 2016. Hawkes is a physiological ecologist whose work focuses on the costs and drivers of migration in vertebrates using emergent technology. Tickets for each lecture series are $20 for the public, or $15 for Newport Aquarium Annual Passholders and Thomas More College students. Registration for this event is available at wavefoundation.org/education/lecture-series. For more information on Newport Aquarium, visit NewportAquarium.com or call toll free 800-406-FISH (3474). Visit thomasmore.edu/marine for more information about the marine biology program at Thomas More College. This entry was posted in WAVE Foundation and tagged academics, conservation, lecture, marine biology, newport aquarium, ocean, Ocean Doctor, Shark Week, speaker, Thomas More College, Wave Foundation by NewportAquarium. Bookmark the permalink.